Is Economic Reality Overcoming Central Bank Manipulations? Markets didn’t move much over the past week, so technically speaking there were no major market movers. However if we look beyond a superficial look at the weekly moves of major indexes, currencies, or commodities, the apparent quiet belies a potentially far more significant development. In the overall scheme of things, last week was another chapter in ongoing story of the past 18 months – of markets being caught in the middle of a tug-of-war between the bullish central banks’ market manipulation via stimulus versus the bearish reality of slowing global growth. For most of the past year, central bank liquidity has won out and pushed most risk assets higher. Over the past three weeks however, the reality of the global slowdown has forced its way back into market consciousness because it is now showing up in Q3 earnings reports. 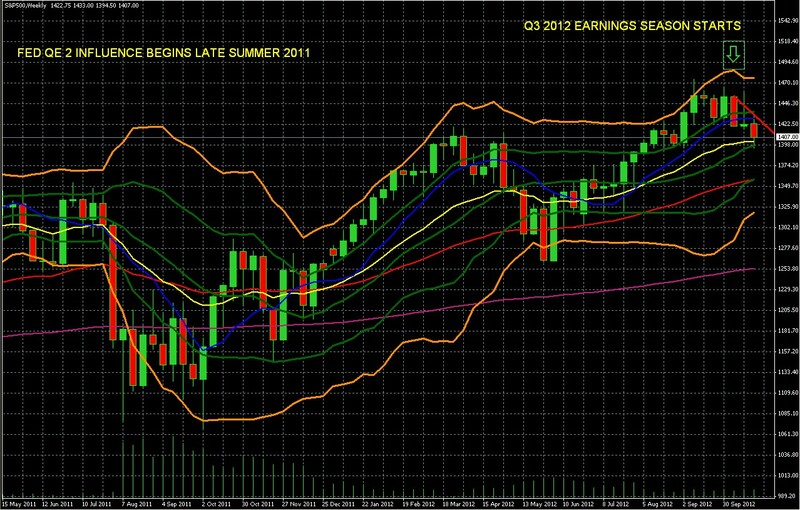 As the chart below shows, the bellwether S&P 500 has been pulling back since the start of Q3 2012 earnings season. Even more companies missing “top line” sales revenue estimates. This is a greater concern because most firms have already exhausted their cost cutting options. To grow earnings going forward, they need to actually improve sales and bring in more gross revenue with that already trimmed-to-the-bone cost structure. More companies are lowering guidance for the future. Still, to keep things in perspective, the bellwether S&P 500’s roughly 50 point pullback from the 1460 area since the start of earnings season has been mild, and is only down about 3.5% from its mid-September high. Actually the dour earnings picture is worse than it looks, because it’s based on forecasts that have recently been revised lower in order to raise the percentages of earnings reports beating expectations. Were the headline numbers less manipulated, markets would likely being showing a more pronounced negative reaction. Hopes for more BoJ stimulus have lifted Japan and to some extent Asian markets because that stimulus helps the region (at least in the short term by adding liquidity) and helps exporters by weakening the JPY, thus lifting the USD and USD index and thus aiding Japan and other Asian exporters. The usual EU worries on Spain and Greece. The EU has complied with Washington’s request for quiet until after the US elections, though on Tuesday Germany’s Finance minister warned that “Europe’s debt crisis seems to have entered a calm phase, but that’s only an illusion…the worst has yet to come.” That’s disconcerting, considering that the past three years have been nearly fatal for the EU as whole and sent much of the GIIPS into deep recession or outright depression. A few bits of random data had short term influence, like China’s beating forecasts for the HSBC flash manufacturing report, showing less contraction than expected. Will the past three weeks’ unpleasant reminder will soon be forgotten and the combined weight of central banks stimulus/money printing can continue to drive risk assets higher or prevent a material pullback? Or are the effects of unlimited liquidity and low rates that have forced cash into risk assets now starting to reach their limit? Are investors losing confidence in the credo of “don’t fight the Fed?” If so, we could see the kind pullback from near-decade highs that the global slowdown and EU contagion risk suggest should happen if markets were moving with the risks posed by the deteriorating global economic situation. Typically earnings season loses its influence after its third week, which has now passed, because the overall tone has been set. So we should have our answer to the above question in a week or two. Note that while the price action in most markets was relatively quiet, there was at least one notable, potentially significant exception. 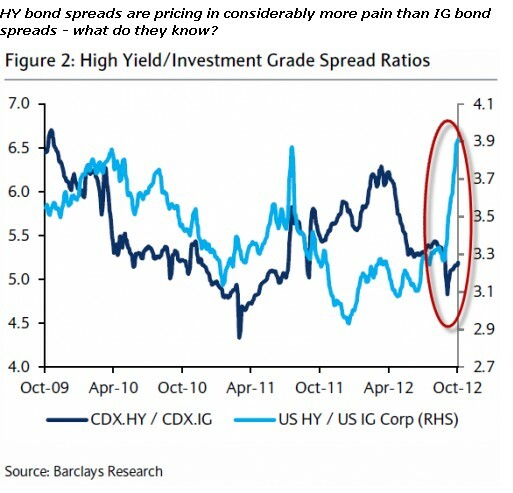 As shown in the chart below, Barclays (via zerohedge.com, see here for details) notes that the spread between high yield (and thus higher risk) bonds and investment grade bonds is at its highest in three years. In other words, riskier bonds are pricing in far more pain than investment grade bonds. The potentially significant implication is that market risk is higher than generally acknowledged by markets in general, as credit markets have bid up the price of investment grade bonds due to hordes of investors willing to pay a premium for safety in a market they see as riskier than generally believed. In my new book, The Sensible Guide To Forex, I discuss the basics of how to use inter-market analysis to improve your performance. I note that bond markets tend to anticipate events better than equity markets. Hence the old saying “credit anticipates, and equity confirms,” (again, hat tip to zerohedge.com for the reminder) so it pays to watch bond markets closely. We continue to repeat the warning, because no one else is doing it. The one thing that is clear at this time is that the major central banks are, if anything, stepping up their money printing campaigns. While the Fed has gotten the most attention for its QE 3, in fact since 2008, the ECB and BoJ have applied stimulus (as a percentage of GDP) far more aggressively. See here for details. This past week the BoJ became the latest major central bank to increase its stimulus plans, and more is expected from it in the coming months. The EU hasn’t even begun unlimited GIIPS bond purchasing under its new OMT program because Spain has yet to provided the needed request for this aid and agree to the conditions that come with it. Japan is expected to introduce yet more stimuli. China and the UK are also more likely than not to do the same. Agree or disagree with this approach as proper public policy, it’s terrible for those trying to preserve and grow wealth for future needs. Everyone needs to diversify out of the USD, EUR, JPY, and other overprinted currencies, and into more responsibly managed currencies or assets denominated in them. The only question is which methods of doing so best suit your needs? Most guides to forex trading advocate methods that are considered too risky and demanding for mainstream investors, and take time to master. Most guides on foreign investing fail to consider the currency, which can turn a winner into a loser and vice versa. To find an entire book on a variety of ways to do this, some of them never before covered in any book, read The Sensible Guide To Forex: Safer, Smarter Ways To Survive and Prosper From The Start (Wiley 2012). Visit the book’s amazon.com page, or the book’s companion site, http://www.thesensibleguidetoforex.com for further details.